This team is surely the best and will give any team a run for their money in the alien conditions. The much-awaited Test series between India and South Africa has been done and dusted already with one match still to go in the series. The visitors were tipped to compete in the alien conditions and were termed as one of the best teamsre to travel. But the way the first couple of games have transpired, the fate of the side seems to have sealed with the performance of their batsmen, especially. However, there are a few positives for them given the way their bowlers bowled who managed to take 20 wickets in both the matches. The main difference between the two sides proved to be the top-order batsmen as the Indians could never embrace the challenge apart from their skipper who batted beautifully in the first innings in Centurion. The hosts were magnificent though and latched onto every opportunity presented by their opposition. Moreover, there was hostility in their bowling which lacked in the visitors’ attack when it mattered the most. Also, there were key lower order performances for South Africa which added some crucial runs in the end. The left-hander has found his way to score runs so far despite struggling against the likes of Bhuvneshwar Kumar and R Ashwin. He is a gritty customer and fights his way in the middle. He got a brute of a delivery in the first Test but came back to register a couple of crucial scores for his team. It was his 61-run knock in the second innings which stretched the lead of South Africa and took the game away from India. So far Elgar has scored 117 runs in 4 outings and would love to score more in the dead rubber. The 23-year-old opener has been extremely special for Proteas as he has got off to an amazing start to his career. Even in the ongoing series he has been extremely brilliant with his footwork and looks elegant while playing his shots. Aiden Markram was unfortunate to miss out on a century in front of his family in Centurion but he made look batting easy while he was at the crease. He is the fourth highest run-getter in the series currently with 134 runs at an average of 33.50. He is doubtful for the final Test due to the injury but his place in the team is not in doubt at all. The Superman of South Africa is the best batsman of this series by a long way. All the fuss about the pitch being favourable for the bowlers has been put to rest by the impeccable batting of AB de Villiers. The way he counter-attacked at Newlands after the hosts lost three wickets for only 12 runs was absolutely superb. Undoubtedly, he is the leading run-scorer in this series so far with 200 runs at a wonderful average of 50. Moreover, his knocks have been more of an impact which has turned the game in his team’s favour. Even in the second innings in Centurion, he came in when the team was reeling at 3/2 and stitched a partnership of 141 with Elgar which eventually won them the game. The comeback series for Mr 360 has been memorable and he would be looking to make it even more memorable by whitewashing the visitors. The Indian skipper Virat Kohli has played only one innings of substance but it is the best of the high-voltage series so far. He fought gamely for his team in the first innings and notched up his 21st Test century scoring almost half of the total of India. His captaincy during the course of the match was also praiseworthy and rotated his bowlers nicely. He is the only Indian batsman who looked comfortable in the middle and is only second best to de Villiers with 193 runs in 4 innings. Though the series is gone, he would want to win the dead rubber and prove that his team can win overseas and are not only the home track bullies. Faf du Plessis is an admirable leader of South Africa as everyone respects him a lot. The team has looked different ever since he has taken over the mantle of the side. With the bat, he grafts it out in the middle and churns out some hard runs for his team. He believes in batting with the lower order which made the difference in this series. He has accumulated 173 runs in four innings but most importantly he was instrumental in setting the targets for his team. Du Plessis has won yet another series now and would be proud of his achievement as the leader of the pack. The left-hander Quinton de Kock has made into this line-up only because of his wicket-keeping skills. He has taken some amazing matches behind the wickets and the way South African pacers were bowling, all the credit goes to him for not dropping even a single opportunity. His aggressive batting is a surplus for any team down the order and he scored crucial 40-odd runs at Newlands in the first innings which made the difference in the end. Though he would be disappointed with his efforts by his standards and would love to improve his stats at Wanderers in Johannesburg. R Ashwin, to his credit, has really bowled well on this tour. He was the key at Supersport for the visitors as he scalped four wickets on the first day. He has been amongst the top wicket-takers in the series in which the fast bowlers have dominated. So far the off-spinner has taken 7 wickets at an impressive average of 30.71 and also hasn’t conceded runs at faster pace. Moreover, his batting technique has been classy and it was his partnership with Kohli which took India close to the total of South Africa in the first innings of the second Test. The best bowler of the series who swung the game in the favour of South Africa at Newlands. His impeccable line and length is deadly which absolutely bamboozles the batsmen of the opposition. There is no surprise that he is the leading wicket-taker of the contest between the top two sides in whites. So far Philander has scalped 10 wickets at a jaw-dropping average of 14.60. He also put his batting skills on display in Centurion when it mattered the most and helped stretch the lead past 250 which eventually won his team the match and the series. Mohammed Shami has been by far the best bowler for the visitors on this tour who has led the bowling attack from the front. He was guilty of dishing out some hit me deliveries early on in both the Test matches but came back strongly in the later stages to pick wickets. He has so far made nine batsmen his bunny after bowling 59 overs in the series at an impressive average of 20.22. He is one bowler who bowls his heart out even when the conditions are not in his favour and always manages to thrive. Kagiso Rabada walks in this team without any doubt with the way he bowls. His ability to swing the bowl at sheer pace has been brilliant which kept the visitors’ batters on their toes. He was also involved in a verbal altercation with Virat Kohli and was pumped up to get him out throughout the four innings. This guy is rocking so far at the highest level and is leading the charts with 9 wickets at 21.77. He backed up the good bowling of his teammates and didn’t give an inch to the struggling Indian batsmen. He would be eager to scalp more wickets in the dead rubber at Wanderers. This 21-year-old kid has been the revelation for South Africa. He replaced the legend of Dale Steyn in the second Test and made the difference straight away. He scalped seven wickets in the match, six of which came in the second innings which helped the hosts seal the deal. His wicket of the Indian captain was the talk of the town on the fourth day which took the cherry on top of the cake. That wicket shattered all the hopes of India to chase down the stiff total. 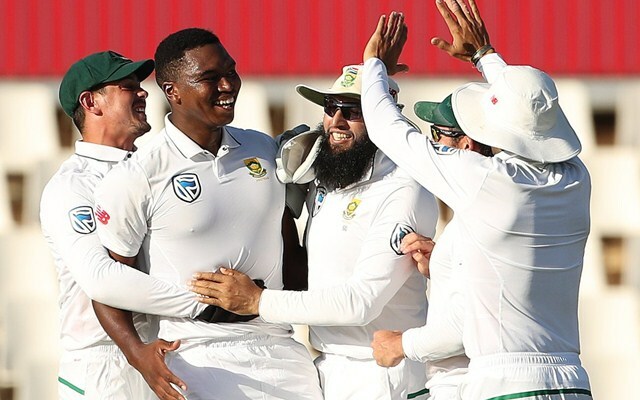 He rattled the remaining line-up on the final day in Centurion and finished with the figures of 6/39 and would want to increase the tally in the final Test of the series.